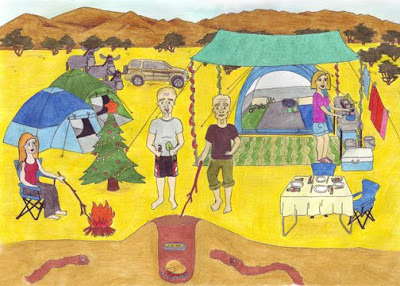 Christmas morning began around 2 a.m. as Al’s torch flickered across our tent as he tiptoed to check on each of the fires. I returned to the cosiness of my paper-thin sleeping bag before emerging at 5.30 a.m. to find him still sitting around a fire in his pyjamas and Father Christmas hat. 7.00 a.m. Add coals. We placed a bag of coals on each fire and stirred. 8.00 a.m. Bury back-up meat. 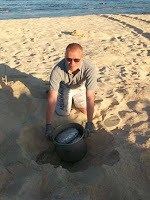 Al placed his prepared lamb and beef in the saucepan and covered it with an improvised lid before burying it all under a large pile of sand. 8.30 a.m. Bury turkey. 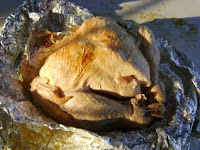 After smothering the bird with lumps of butter, we wrapped the the animal in numerous layers of foil before placing it on top of the coals. Large foil trays were placed around the parcel to make a frame into which more hot coals were scooped. 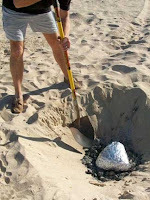 Another foil lid went on top and everything was then buried in sand. We both stood back with large pokey sticks in hand to admire our handiwork. Good father and son bonding. It was the most beautiful morning on Tiwi bech as Wizzard’s ‘I Wish It Could be Christmas Everyday’ warbled across the sand while we unwrapped presents around the tree. 10.00 – 14.00 p.m. Ad-hoc snoozing. 14.30 p.m. Start barbeque for the roast potatoes. 15.00 p.m. Sta rt third fire to warm stuffing and keep food hot. 15.30 p.m. Commence roast potatoes. The tray of par-boiled spuds fitted perfectly in the Weber and it was not long before their delicious smell was drifting through the camp. 16.00 p.m. Turn spuds...you get the picture. 16.00. Remove turkey. 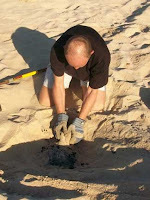 There was much excitement as we scraped away the top layer of sand to reveal the foil bundle before switching to a smaller spade to avoid damaging the delicate package. The bird was levered out with the shovel and placed on the table. The smell of turkey and burnt fingers grew stronger and stronger as each layer of foil was removed to reveal the most wonderfully succulent turkey. With some relief and tremendous satisfaction we placed the bird aside to rest. 16.00 p.m. Rest spuds and add more barbeque coals. 16.15. p.m. Remove back-up meat. Al’s packages were easier to remove from the saucepan. The lamb was perfectly cooked. The other meat produced a vast amount of gravy but the cut of Indian beef may not have been the best choice. Nonetheless, our experiments were a complete success. 16.15 p.m. Begin cooking sprouts and carrot. 16. 30 p.m. Replace spuds and finish. 17.00. p.m. Remove spuds and cook pigs in blankets. 17.00 p.m. Place stuffing on third fire. Place vegetables around fire to keep warm. 17.00 p.m. Warm bread sauce. 17.30. Serve. Without doubt the most demanding and satisfying meal we have ever cooked. It was a culinary masterpiece. 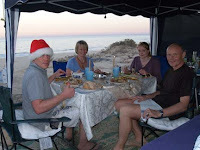 Christmas dinner on a beach at sunset, the sound of gently crashing waves, temperatures in the low 20s centigrade, mountains behind and dark blue clear skies.